Burritos are like Indian Frankies! Tortillas are wrapped up with ingredients like beans, peppers, onions, cheese, salsa, and others, to make mouth-watering Burritos. Chimichangas are deep-fried versions of the same. Burritos are so filling that they can be had as a satiating meal. There is also a lot of scope for innovation. 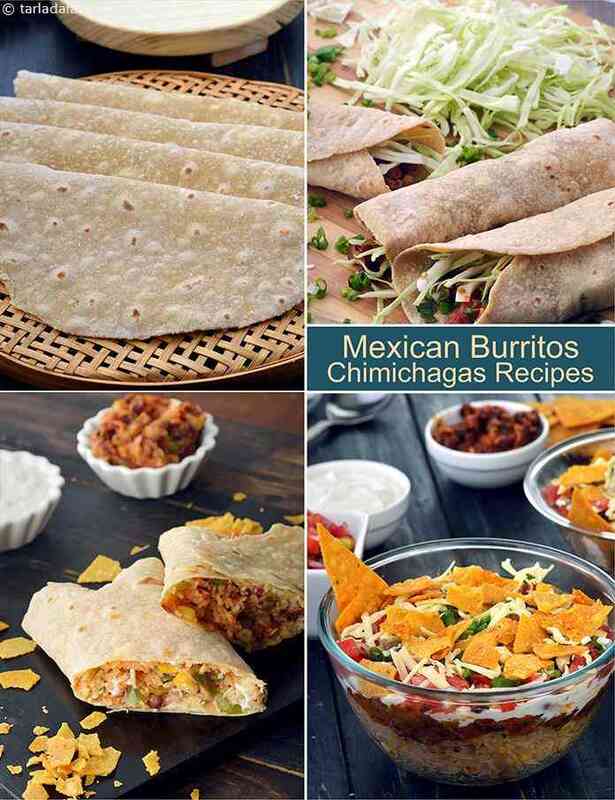 Not only can you pack in any-many interesting ingredients inside the wraps to make delectable snacks like the Mexican Bean Fajita , you can also make them into several off-beat forms as in the case of the Burrito Bowl. What Samosa is to Indians, Chimichangas is to Mexican . A popular dish is southwestern American cuisine, Chimichanga is basically deep-fried burritos with a filling of refried beans, topped with sour cream, tomatoes and guacamole. Throwing a party? try out this mexican delicacy. . . Tortilla stuffed with protein rich bean filling and iron rich green salsa! A Mexican cuisine inspired recipe, Mexican veggie chimichanga has tortillas filled with a beans(boiled rajmah), onion, red capsicum and green chilies mixture along with a spicy salsa sauce. The crispy chimichangas are served with a sour cream topping and garnished with olives, pepper and lettuce. a easy way to win someone's heart thru the stomach!!!!! Bean burrito are a Mexican delight and are typically referred to as the soft flour tortillas which are filled up with cooked beans, tomato sauce and herbs. Burritos are a Mexican snack item with the tortilla wraps filled up with beans and avocado dip and then served hot. Mexican burrito is basically soft tortillas made from flour and then stuffed with an authentic Mexican style filling made of beans, salsa sauce, cheese and tomatoes. Tasty mexican dish of tortillas filled with shredded vegetables and mozzarella cheese. A simple preparation of the famous Mexican burrito from leftover rice and chappatis. Serve with generous amount of taco sauce. A simple and delicious recipe made using leftover dishes in your house. Vege Fajita, soft tortillas stuffed with crunchy veegies and sprouts, excitingly flavoured up with Guacamole, chilli garlic sauce and pepper powder are wrapped and grilled on a griddle. Crunchy and tasty to bite into this dish is a treat for your taste buds.